The U.S. Department of Labor's Occupational Safety and Health Administration (OSHA) updated the recordkeeping rules for injury and illness data recorded by employers affective January 2015. Information previously recorded and kept on-site in case of inspection now must be reported to OSHA directly or via your state agency. • All work-related fatalities within 8 hours. • All work-related inpatient hospitalizations, all amputations and all losses of an eye within 24 hours. 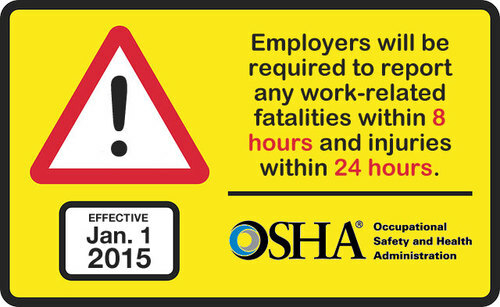 Employers must report work-related fatalities within 8 hours of finding out about it. Only fatalities occurring within 30 days of the work-related incident must be reported to OSHA. For any hospitalization, amputation, or eye loss employers must report the incident within 24 hours of learning about it. The new rule retains the exemption for any employer with ten or fewer employees from the requirement to routinely keep records. 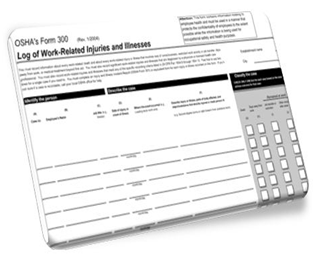 Employers with ten or more employees had generally been using the OSHA Form 300 to record individual injuries or illnesses occurring in the workplace. These incidents were then summarized on the annual OSHA 300A Log for posting in an employee accessible area. Those processes will remain the same with the addition of reporting an individual incident to OSHA directly or through the state agency such as IOSH in Iowa. Until each state agency has developed a state specific form, IOSH recommends the use OSHA Form 301 to ensure adequate information is being reported per the new regulation. Facilities located in States under Federal OSHA jurisdiction must begin to comply with the new requirements on January 1, 2015. Facilities located in states that operate their own safety and health programs (State Plan) should check with their state plan for the implementation date of the new requirements. Requires Microsoft Excel, Excel equivalent. c) Visiting 1000 E. Grand Avenue, Des Moines, Iowa. The Iowa compliance date for reporting under the new rule was January 14, 2015.  Calling OSHA's free and confidential number at 1-800-321-OSHA (6742).  Calling your closest Area Office during normal business hours.  Using the new online form. 1) By telephone to the nearest OSHA Area Office during normal business hours. 2) By telephone to the 24-hour OSHA hotline (1-800-321-OSHA or 1-800-321-6742). 3) OSHA is developing a new means of reporting events electronically, which will be released soon and accessible on OSHA's website. The Federal compliance date for reporting is January 1, 2015. February 1 until April 30th each year. Those processes will remain the same with the addition of reporting an individual incident to OSHA directly or through the state agency such as IOSH in Iowa. Visiting 1000 E. Grand Avenue, Des Moines, Iowa. By telephone to the nearest OSHA Area Office during normal business hours.